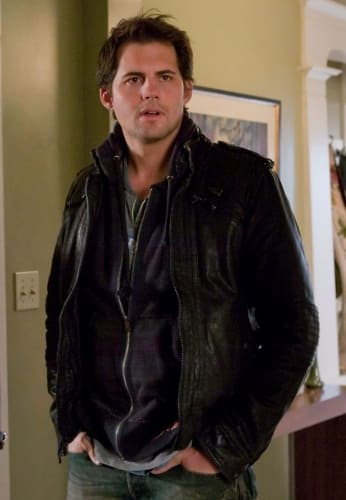 Kristoffer Polaha stars as Nate "Baze" Bazile on Life Unexpected. On falling in love with Baze: I read for the role in December 2008. I really just fell in love with the script and responded to the material in a way that I related to. Some characters pop off the page and Baze was definitely like that for me, as I could visualize myself playing him right away. He's a rogue character, which is rare to find on TV. You normally see all clean stuff. This guy is a lot of fun to play. He hit my sweet spot as an actor. On shooting the pilot... and then waiting: We shot the pilot in Canada in January 2009. We were the first CW pilot to film - and the last to get picked up. Early in the fall, The CW was debating between us, the Gossip Girl spin-off and The Beautiful Life. It's tough when you're on something that's special in every way and you just know it. Finally, [CW President] Dawn Ostroff gave us the green light in September. On Kerr Smith: Some actors are douchebags. But I was pleased to learn that Kerr is great. I love working with him. On Brittany Robertson: She's only 19 years old, but is extremely intelligent and professional. You'd think she'd be a bit green and, as an older actor, I'd have something to teach her. But she's like an old pro. Very talented. Fun to work with. On creator Liz Tigelaar: She's doing such an unbelievable job. There's this strong spirit of collaboration on the show. You're always an actor for hire, but she trusts us with the material as much as anyone I've ever worked with. It's really been a dream job. On a possible return to Mad Men: I've been brought back at least once each season for a scene or two. I can't say it's a guarantee, but I'd be surprised if I don't get a phone call.